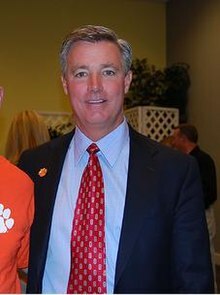 Tommy Pearce Bowden (born July 10, 1954) is an American football coach who served as the head coach at Clemson University from 1999 until October 13, 2008. He is a son of Bobby Bowden, former head football coach of Florida State University, against whom he has coached in games nicknamed the "Bowden Bowl." He is also a brother of Terry Bowden, previously head football coach of the University of Akron. Before coming to Clemson, Bowden was the head coach at Tulane University, and an assistant at the University of Alabama, Auburn University, Duke University, the University of Kentucky, East Carolina University and, with his father, at Florida State. His 1998 Tulane squad went 12–0 and achieved a top-10 final ranking in both polls. Despite being one of only two undefeated teams in the regular season, Tulane was not even considered for a bid in a Bowl Championship Series game because it was believed they had not played a legitimate schedule. Bowden was hired as Clemson's head coach before the 1999 season. Bowden's Clemson teams went to a bowl game every year he coached there, except in 2004, when, after a brawl with rival South Carolina, both teams withdrew from bowl consideration for that season. He resigned on October 13, 2008, after leading the team to a disappointing 3–3 record (1–2 ACC) at the midpoint of a season in which the Tigers had been an almost unanimous preseason pick to win their first ACC title under Bowden and were ranked #9 in the preseason polls. Assistant head coach/wide receivers coach Dabo Swinney was named as interim head coach for the remainder of the season. ‡ Bowden resigned on October 13, 2008. Wikimedia Commons has media related to Tommy Bowden. ^ "FCA: Ex-Clemson coach helps put faith in play at schools". ^ Atheist, Friendly. "New Report Highlights Troubling Blend of Christianity and College Football at Public Universities". ^ "News for Pawleys Island, Litchfield and Murrells Inlet". www.coastalobserver.com. This page was last edited on 12 January 2019, at 02:24 (UTC).